We’re celebrating two very special numbers – 20 years and 20,000 students – at Youth Connection Charter School (YCCS)! Twenty years ago, in 1998, we graduated our first class of students, and now, in 2018, our 20,000th student will be graduating! The amazing story of our students’ achievement began in response to Secretary of Education Terrell Bell’s landmark report, A Nation at Risk, which focused on the nation’s failed public education system and claimed that Chicago, too, had a failing school system. At the time of the report, Chicago was witnessing growing numbers of drop-out and off-track high school students, unable to complete the traditional system that was in place. Chicago Public Schools recognized the growing needs in neighborhoods across Chicago for alternate educational environments and took the opportunity to create a new educational landscape for students of poverty and disability. In 1997, Youth Connection Charter School was chartered as a Chicago Public high school, the sole chartered high school in Illinois to advocate, develop, and provide world-class education to high school dropouts in partnership with community-based alternative high schools. In the two decades that have passed, YCCS has played a transformative role in the lives of Chicago’s most vulnerable youth, making a positive impact on the social fabric of our city through its partnerships with community-based organizations who have served their neighborhoods for over 40 years. It was not easy then, and continues to be a challenge now for our students, the great majority of whom come to us from Chicago communities suffering from the highest rates of poverty and violence. Yet, despite the challenges, most of them persevere not only to graduate from high school, but to go on to college and the workforce. 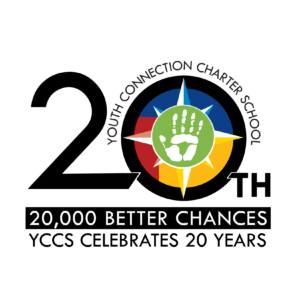 This autumn, YCCS will be celebrating our 20,000th graduate along with the career accomplishments of our students, teachers, mentors and others who dedicate themselves to turning around the lives of these young people for the good. The YCCS 20thAnniversary Event on October 25, 2018, will take place at Chicago’s Theater on the Lake. Our special guest, Cook County Board President, Toni Preckwinkle, who has been a committed supporter of our mission for the last 20 years, will be joined by esteemed Community leaders, Educators, Politicians, Alumni, Parents and our amazing and accomplished Students.